It could never have been an easy proposition to remake The Jungle Book - even with the enormous resources that Disney has at its disposal. The 1967 animated feature - an adaptation of Rudyard Kipling’s novel - is a precious memory for so many. Mowgli the man-cub - played by the adorably scruffy Neel Sethi - has only ever known the animal world. Left in peril as a toddler alone in the jungle, he is rescued by wise panther Bagsheera (Ben Kingsley). Although Mowgli has literally been raised by wolves, he can’t help but to use human ‘tricks’ — a water bowl, levers and pulleys - that make him different from the rest. The boy gains a vicious nemesis in the war-scarred tiger Shere Khan (Idris Elba), who hates humans and wants the boy killed at all costs. Forced to leave his wolf pack behind, Mowgli must face the deep, dark heart of the jungle and all its inhabitants — but not without help from his animal friends. Director Jon Favreau does a stellar job of restoring the fable for a new generation of children, offering little in the way of radical alteration of the material. There has been a rethinking of the original music - in this iteration, it is mostly subsumed by the plot. But certain beloved songs do sneak their way in, and Favreau’s restraint with them make those moments all the more enjoyable. Other changes mostly concern Kipling's very 19th century meaning of ‘civilisation’ or the ‘natural order’. In 2016, Favreau seems to tell us, ’the natural order’ is to be loyal to your family and friends — even if they are wolves, a panther and a bear. Mankind be damned. The CGI is photo-realistic enough to pass for wildlife documentary; each animal is beautifully rendered. Care is taken in capturing a tiger’s loping movement or a wolf’s ears as they flatten with fear. But of course, this is Disney; the animals are anthropomorphic. Monkeys grow to three times their normal size, crocodiles make peace during droughts, and tiny green frogs, evidently fed up with the weather, wipe rainwater off their heads. The jungle too, with all its verdancy and vastness, has a hyperbolic effect. The setting is nudged ever so slightly into exaggeration - as it can only be in storybook imagination. The King Louis scene deserves a special mention — offering perhaps the film’s only gag for adults. The monkey king, voiced by Christopher Walken and obscured by shadows in temple ruins, blatantly invokes — of all things - Colonel Kurtz in Apocalypse Now. This is a rarity, though. Most of the film seems too pure for that kind of in-joke. Ultimately, it’s this affection for the material that makes The Jungle Book so lovable. Baby Mowgli introduces himself to Bagsheera by pulling on his mouth and stroking his velvety nose, sweetly unaware of the potential danger. Forest animals scatter for cover while Baloo, (wonderfully voiced by Bill Murray) and Mowgli croon ‘Bare Necessities’ together. The spirited, brave little Mowgli and his story wave the flag for loyalty, friendship, and adventure — values we can all get behind. 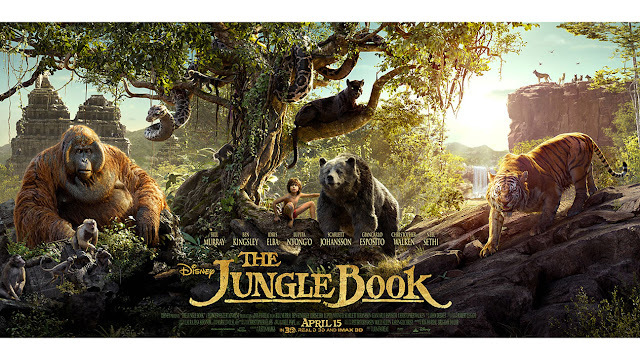 But maybe the best thing to say about The Jungle Book is that it evokes a genuinely child-like sense of wonder. For a film like this one, there’s no greater compliment. Now showing at Nottingham Cineworld.